Senior Jacob Berkowitz wrestles an opponent. Berkowitz will compete as the No. 6 seed in his weight class at the Big Ten Championships. 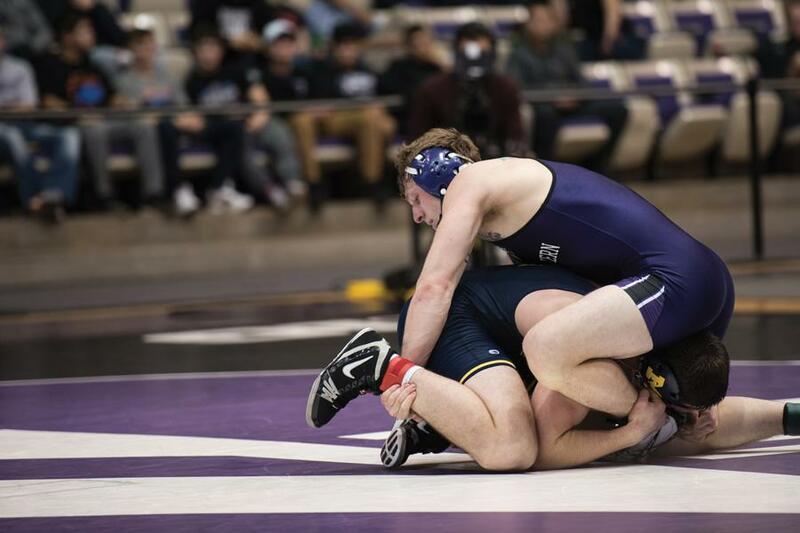 Northwestern has one more chance to bolster its resume for the NCAA Wrestling Championships, as the wrestlers head to Bloomington, Indiana this weekend for the Big Ten Championships. NU (7-8, 2-7 Big Ten) will have six pre-seeded wrestlers for the tournament, the conference announced Monday. However, the Cats will be set up for tough competition as the event, which begins Saturday, will feature 11 of the top 25 teams in the national dual rankings. NU’s highest ranked wrestler in the championships is senior 197-pounder Jacob Berkowitz, who received the No. 6 seed in his weight class. Fellow senior and 157-pounder Ben Sullivan, who went winless in the conference, earned the last pre-seed in his division. Along with the veteran duo, junior and No. 9 wrestler in the 184-pound weight class Mitch Sliga, 174-pound freshman Braxton Cody and a pair of redshirt freshmen, 141-pound Alec McKenna and 133-pound Jason Ipsarides, all earned pre-seeds for the championships. Though having six pre-seeded wrestlers going into Saturday’s start of the tournament is promising, those numbers do not necessarily guarantee postseason success, coach Matt Storniolo said. Berkowitz will headline the Cats’ lineup going into the Big Ten Championships, as the 197-pounder recorded 12 dual wins en route to a team-high 22 victories during the regular season. The fifth-year senior has won six of his last eight matches coming into the weekend and will look to secure a spot to compete at the national championships in St. Louis. While the majority of NU’s starting lineup received recognition from the Big Ten committee, a few of the NU wrestlers were snubbed. Among those left out is sophomore heavyweight Conan Jennings, who is approaching Saturday with a vengeance. Jennings, who picked up nine dual wins during the regular season and climbed into the national ranks at one point, finished the season on a four-match losing streak. But the heavyweight said he’s ready to rebound.